WAIT is a workplace stewardship program designed to manage portions of commercial property for wildlife. Designated areas on workplace grounds are transformed into wildlife habitats that can sustain life for diverse wildlife species. These habitats are an inspiration for wildlife education that benefits employees and the entire community. The potential wildlife projects and partnerships that may be implemented at the workplace are endless. Projects are determined at each site to meet the desired objectives and goals of the company as well as to match species to their compatible ecosystems. Pfizer colleagues and community volunteers have enhanced 72 acres, including 22 acres of wetlands, 22 acres of meadows and 28 acres of woodlands for wildlife. They installed nesting boxes for owls, wood ducks, nut hatches and bluebirds, as well as mourning dove and kestrel nesting structures and a dozen reptile and amphibian cover boards. One habitat type that is in rapid decline in today’s landscape is the meadow - a diverse mixture of native grasses, wildflowers and other non-woody plants that are allowed to complete their annual cycle of growth, flowering and seed production. These early succession habitats are good for pollinators, song birds and quail and turkey as the flowering plants that occur in meadows attract numerous species of insects and butterflies, while the seed of these flowers and grasses are an important source of food for songbirds. In addition, the dense leafy cover of the meadow is an important nesting area for ground-nesting birds. In general, any open area (from ¼ acre to many acres) can be developed into a meadow. Maintaining a meadow can reduce overall landscape maintenance costs through reduced mowing. Stop mowing the area during the growing, flowering, seeding season (for most species this is April through October). This allows grasses and wildflowers to fully develop and to dominate the area. Mow the area at least once every three years (or as frequently as once every year) during the winter season. This will prevent trees from taking the area and changing it into a young forest stand. Establishing a border between forested land and fields or meadows provides “edge effect,” which is beneficial to many different species of wildlife. An “edge” is where two different habitat types meet and usually contain more species of wildlife than either one of the adjacent habitats. A 25-50 foot border left unplanted will provide nesting and brood rearing cover and food sources in the form of native weeds, seeds and insects. Once these strips have been established (after 2 years), half of these borders should be lightly disced between November and March, in order to set plant succession back and renew the habitat. Discing can then be repeated every 2-3 years at the same time of year. Similar to edges, filter strips are bands of vegetation adjacent to ditches or other water bodies that serve to trap sediments, chemicals and nutrients. Filter strips can be as narrow as 12 feet in width, but 25-50 feet is better. Maintenance by shallow discing on a 2-3 year cycle is necessary to sustain the proper succession vegetation. Ditches with filter strips on both sides should be maintained by discing only one side in a given year. 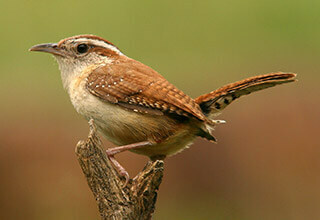 Rabbits and Carolina wrens respond well to man-made brushpiles in suitable habitat. Brushpiles should be at least 15 feet in diameter and about 5 feet high with openings at ground level. Rabbits eat their way in by clipping small twigs to open up and wrens nest within. It is a good practice to pile brush over large rocks, logs, culverts or old farm machinery to serve as the foundation. Allow grass and weeds to grow around the brushpile and place it near the edge of forest openings. Brushpiles are critical because they provide an area to raise young and escape from predators. There are a number of ways to enhance natural habitat on your property to attract songbirds. When possible, retain dead trees or “snags,” unless they pose a threat to human life or property. Snags are ideal for cavity-nesting species such as woodpeckers, chickadees, bluebirds and others. Another option is to install nest boxes on the property to attract cavity-nesting species. Shrubs provide cover and reproduction areas for songbirds so avoid trimming the lower branches. 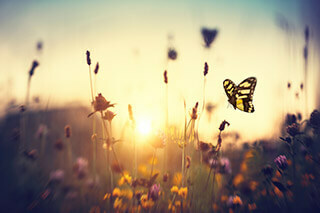 Flowers, such as sunflowers and other annuals, attract insects that in turn attract insect-eating birds. When flowers go to seed, a food is available for seed-eating birds. Partridge pea, millet, other small grains and shrub lespedeza also provide food for songbirds. Warm season grasses are better for ground nesting birds because they provide open space at ground level and spread upright, forming an overhead canopy. These grasses also provide a food source for rabbits, doves, deer and turkey. When planting warm-season grasses, use a combination of two or more such as switchgrass, big bluestem and Indiangrass. Native warm-season grasses have been replaced by introduced grasses such as fescue and coastal Bermuda grass in much of the southeast. These aggressive pasture grasses usually outcompete desired native quail food and cover plants and must be controlled or eradicated in areas where quail habitat management is desired. Blackberry patches and plum thickets produce fleshy fruits that are particularly important to incubating hens needing easy access to high-energy foods. These thickets should be located near nesting sites and protected since they also provide shade for hens and broods, escape cover and good loafing areas.